The Privacy Screen series Web Browser helps you to view webpages without worrying about prying eyes from looking at information in the web browser screen. The program has a capability of the on/off screen shield action, so you can instantly protect your privacy when using webmail or viewing websites. This is software-driven functionality to quickly turn on/off the screen filter to protect your privacy or clearly view data including image and movies in the web browser screen by using the button as you want, unlike a stick-on filter or film. The screen can be decoratively and stylishly filtered, not just effectively! The filter's darkness can be controlled to accommodate dark/bright areas. - Download function supporting audio, video, image and document files is not available. - Six filters are pre-installed (a lot more available on the paid version). - Images in Camera Roll cannot be used as filters. - Up to 5 bookmarks can be added. - User-agents cannot be optionally added or edited. - The Privacy Screen functionality is not designed to make the on-screen information completely invisible the screen from the sides, but make it less invisible in an effective manner. 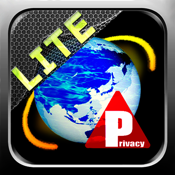 - This software is not designed for access to restricted mobile websites with IP address filter, etc. ISB does not guarantee the operation (e.g. view of webpages) of this software with the user agent changed.